Summer is in full swing and in my household it's an extremely busy time. We try to pack as many summer activities into the two months the kids have free from school and that means that we are always on-the-go. This summer is little Anthony's last hurrah as he will begin Kindergarten in August and that means that he is really enjoying his last free summer before starting school. Because the kids have so much on their plates in the summer we make sure that they have a good start to each morning so they can have enough energy to carry them through the day. And just like it's important for us to start the day off right, it's just as important for the kids. The morning sets the mood for the day and I try to make sure his morning is the best possible. Sleep in: During the summer the kiddos are allowed to sleep in, something they can not do during the school months when they have to be up by 7:00AM. Sleeping in is especially important because they do so much during each day that their bodies really do need that extra sleep and rest to recuperate. Have a good breakfast: When they days are going to be long we try to give the kids something substantial for their little bodies to go on. One of Anthony's favorites is oatmeal with apples in it. Take your vitamin: I've always given my kids and grandkids a good multivitamin as part of their daily regimen. While I try to make sure they have a balanced diet, summer days can mean we don't eat as good as usual so a multivitamin is necessary for those extra vitamins and minerals. Zarbee's Natural Kids Multivitamins are new to Walmart and I immediately wanted to try this brand because I already purchase some of their other products for the younger boys. 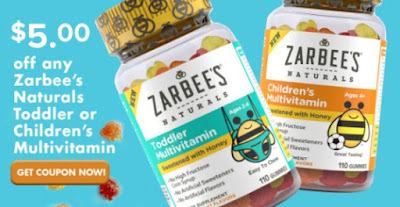 What really caught me eye about Zarbee's Natural Kids Multivitamins is that they are made with fruit pectin and sweetened with honey. Not giving the boys: high fructose corn syrup, artificial flavors and gelatin is a big plus in my book. When I was growing up my mom always looked for more natural ways to give us vitamins. I remember she used to grow her own herbs and would make us teas and find other ways for us to get those extras, but without giving us anything purchased in a store. I don't have the patience that my mom did, nor the talent, to grow my own herbs to give the kids. Instead I trust brands that provide those same qualities, but already made. Anthony really likes enjoys taking his two Zarbee's Natural Kids Multivitamins each morning. I like knowing that he is getting 11 essential vitamins, which he will need on this busy summer day. Talk: One thing you must have noticed if you have kids is how much they love to talk. Right after breakfast and before the day gets busy is a great time to sit down and have a nice conversation. Anthony talks about how he can't wait to go to school and how he's going to have a lot of friends. Get active: Technology can be a big summer trap and it's one we try to stay away from for the most part of the day. Instead of letting the kids go straight to tablets or television watching, we start our first activity of the day. This week it's swim class, another first for Anthony and one that he loves! Summer will be over before we know it and all that will be left are the memories. That's why we try to squeeze every good moment out of each day and starting each day off right is so important. Find Zarbee's Natural Kids Multivitamins in Walmart. Get $5.00 off Kid's Multivitamins (Children's or Toddler varieties) for a limited time, redeemable ONLY at Walmart.